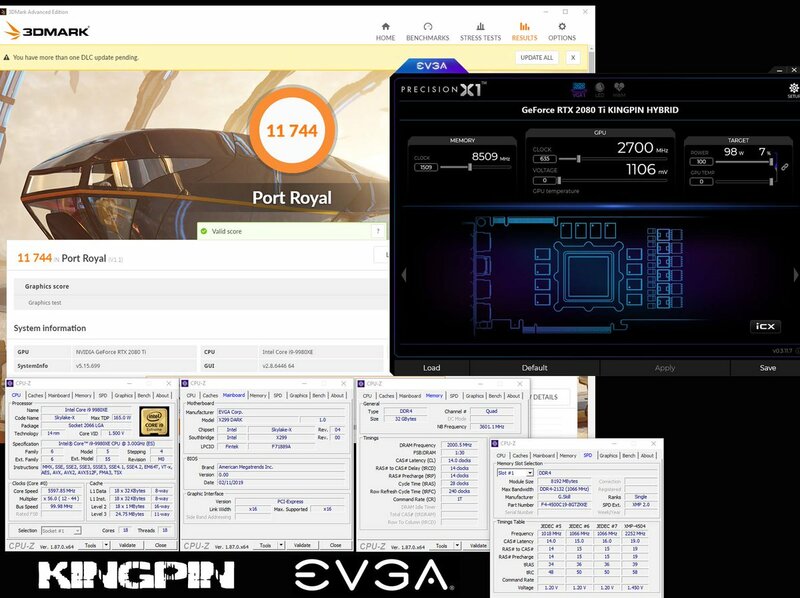 As teased earlier this month, pro overclocker Vince 'KingPin' Lucido has gained the top spot in the 3DMark Port Royal Hall of Fame for systems packing a single GPU. KingPin's 3DMark Port Royal score was 11744. An untweaked GeForce RTX 2080 Ti might typically score about 8000 in this benchmark, so the extreme OC adds an extra 50 per cent performance on top of the fastest consumer graphics card currently available. 32GB of G.Skill TridentZ DDR4 RAM. The above listed GPU and CPU were both cooled byLN2. This enabled KingPin to run the RTX 2080 Ti at 2.7GHz, and its onboard memory at 8.5GHz. The Intel Core i9-9980XE ran at up to 5.6GHz too, thanks to the LN2. Last but not least the G.Skill system RAM ran at 4GHz. 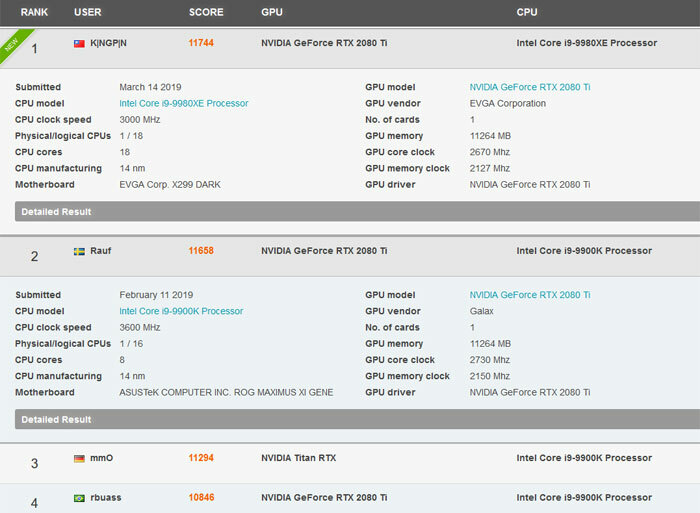 If you look through the 3DMark Port Royal Hall of Fame charts at the new record holder, you will see that KingPin edged ahead of overclocker Rauf, who also used a GeForce RTX 2080 Ti, but using a model from Galax. In fact Rauf got his RTX 2080 Ti running faster than KingPin, but it seems like the benchmark responded favourably to the more powerful CPU used by KingPin (Rauf used an 8C/16T Core i9-9900K). Both KingPin and Rauf are significantly ahead of the third placed RTX 2080 Ti entrant which scored 10846. 3rd place in the picture is at 11294, 10846 is 4th place. How is this achieved with lower clocks speed than the second one? firmware, i suspect… The target clocks, for a while now, have little meaning on actual clock speeds. The cards adjust speeds depending on power targets, temperatures, firmware targets, and the values you set. Also, another trick is to use different power/speed profiles on different parts on benchmark to achieve higher scores. Say clocking lower at a part of test which usually crashes when using higher clocks, and then going back to higher clocks when its less load and wouldnt crash. The test in this respect has fallen behind, it really should show avarage/min/max clocks in test data to have any idea. Since both nvidia and amd are heavily adjusting clock speeds depending on load. Anyway, it's an extreme OC, so for consumer not really useful info. There's a couple of videos on youtube with kingpin recently by gamers nexus. He gives a good talk about what was required in over clocking a GPU on water. Not the Ln2 version but the theory would be similar.